The Egyptian central bank devalued the pound on March 14, in a long expected move that sought to find a middle ground between the black market trade value of the Egyptian pound and the government’s de facto peg to the U.S. dollar. The current rate of 8.85 Egyptian pounds to the U.S. dollar is a 13 percent devaluation from government auction prices last week at 7.73, but still below black market rates as high as 9.5 pounds to the dollar found on the streets of Cairo. 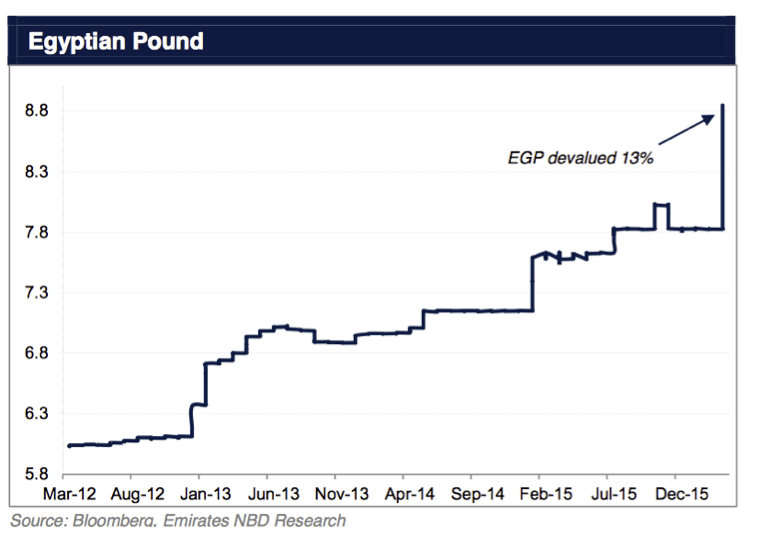 The Egyptian authorities have agreed to essentially create a managed float of the currency (though details are yet to be public), meaning that they will not defend the value of the pound at a set rate, but rather could expect it to fluctuate within a range. Some analysts expect the pound has further to fall, perhaps as much as 9.25 to the dollar. Egypt’s economy is under increasing pressure, as are the economies of many of the oil importing states across the Middle East and North Africa. There are several reasons for the slowdown in economic activity. First, trade flows globally have slowed, as even Chinese exports were down nearly 25 percent in February from last year, the fastest pace of contraction in seven years, according to Emirates NBD. The MENA region has been especially hard hit, as exports from the region were down by an average 7.1 percent in February compared with this time in 2015, the latest in nearly a year of consecutive monthly declines. MENA countries are also importing less, with regional currencies experiencing inflation and deteriorating exchange rates against the dollar. Morocco, which continues to do better than most of its peers, is still facing a currency depreciation of nearly 20 percent since 2014. Moreover, Egypt’s economy relies on domestic consumption to fuel growth. Household spending is equivalent to 80 percent of gross domestic product in Egypt, which means that the slowdown in the tourism industry (a major source of employment, particularly in the informal sector) and public sector employment could have drastic effects on the country’s ability to rebound economically. A major source of income for Egyptians is remittances, which are also a significant source of foreign exchange. The slowdown in the oil-producing Gulf states will have a secondary impact on Egyptians working in the Gulf and sending money home to Egypt. Already, Emirates NBD data for fiscal year first quarter (July to September 2015) points to remittance flows dropping 9 percent from the same period during the previous year. Analysts expect remittance flows from October 2015 to March 2016 to further decline. Finally, international factors, especially aid from the Arab Gulf states in oil products, loans, and cash injections to the central bank, have been a lifeline for the Egyptian economy in the last five years, especially since 2013. With the contraction of Gulf economies due to the decline of oil revenue, aid to Egypt will be secondary in priority to domestic spending and restructuring priorities, especially for Saudi Arabia. The political ties between Egypt and the Gulf states are also under stress, which can additionally undermine aid commitments and delivery. It has been a year since the last investor’s conference in Sharm el Sheikh, where the United Arab Emirates, Saudi Arabia, and Kuwait committed political backing to Egyptian President Abdel Fattah al-Sisi, and renewed financial pledges of $12 billion, including $3 billion in direct deposits to the central bank. 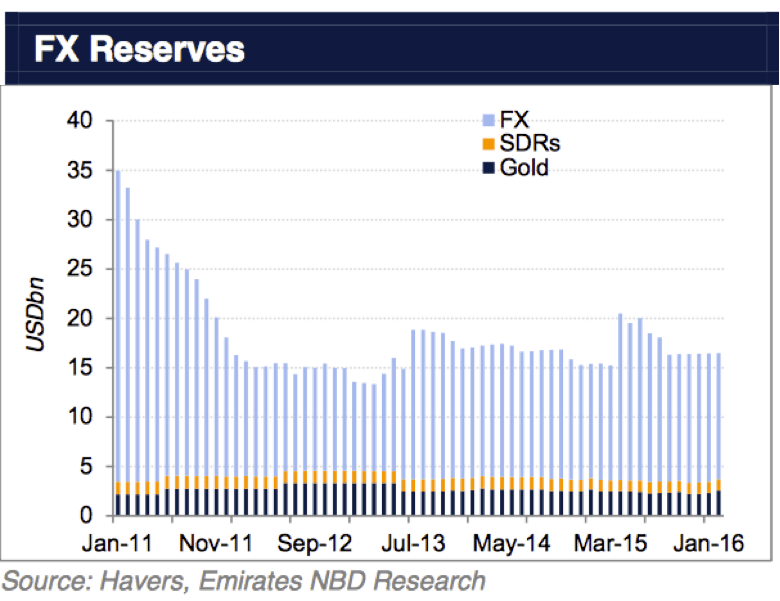 Those deposits have not been able to boost Egypt’s foreign exchange reserves back to pre-2011 levels. Moreover, the levels of aid and direct cash assistance are not continuing from the Gulf states. As one example of the current aid appetite from the Gulf, Saudi Arabia pledged support in oil products to Egypt in January, as part of a five-year aid package that also promised to invest in Egypt’s small and medium sized enterprises. Egypt is not in a position to wait five years for a potential investment in local businesses that are not likely to survive an inflation crisis. Instead, it looks like Egypt may have to return to negotiating with the International Monetary Fund, which will have a very different reform agenda than its Arab Gulf state allies. To start, the IMF will question more forcefully the legacy of the state, and especially military, ownership of major industry. Of course, the rehabilitation of the Egyptian economy is not the responsibility of the Gulf, but the last five years have set a precedent in bilateral relations that will be difficult to replicate with international financial institutions.